The funerary boat - customarily decorated with red, white, and black as we see here - is a traditional Egyptian tomb offering created to symbolize the transport of a deceased individual from life to the afterlife. 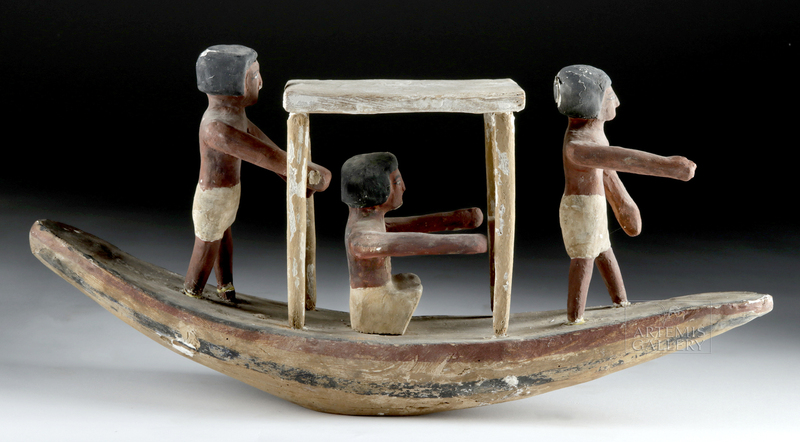 Scholars believe that the Egyptians envisioned death as a journey via boat across the River Nile - the sacred river which ran down the center of the country and was respected as a resource for agriculture, trade, transport, and a symbol of fertility. 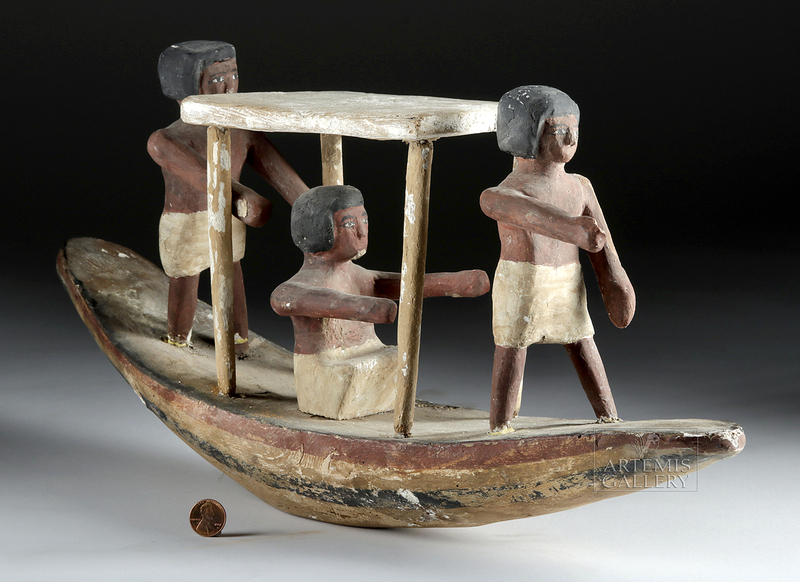 During the Sixth Dynasty, it became common to place wooden models of lifelike scenes in Egyptian tombs; by the Middle Kingdom, they were placed in the tomb chamber, around the coffin, although some very rich tombs had a separate chamber just for wooden models. 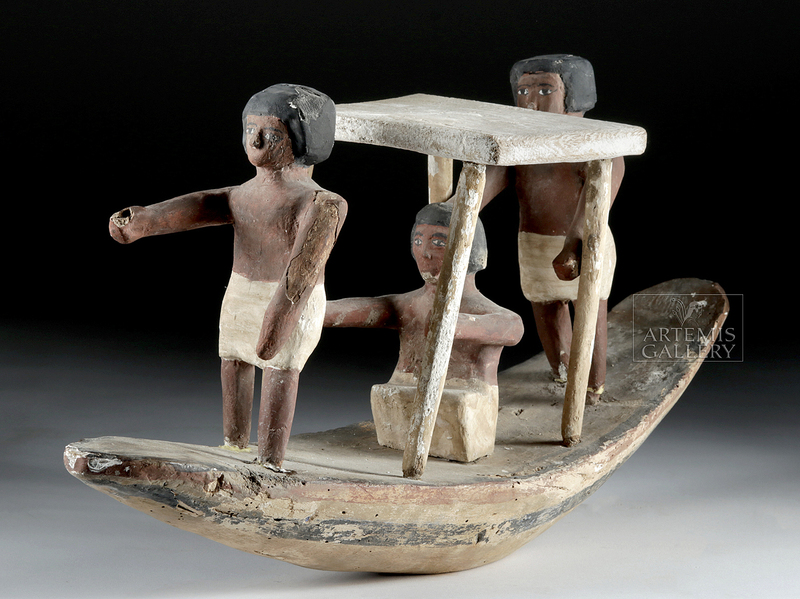 Two ships are found in almost all tombs that have models from this time period, and those ships are, during the Middle Kingdom, staffed by boatmen. 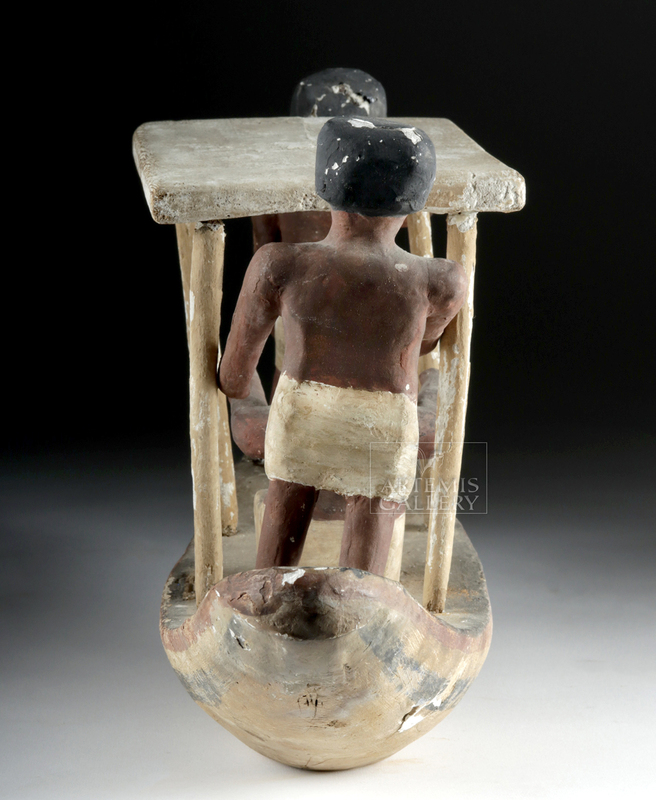 According to the curatorial team at the MFA Boston, such funerary vessels "made of papyrus bundles lashed together, transported the deceased either to a cemetery across the Nile or to the sanctuary of the god of the afterlife, Osiris, at Abydos. Models of such vessels were painted white with reddish lines representing the bindings." 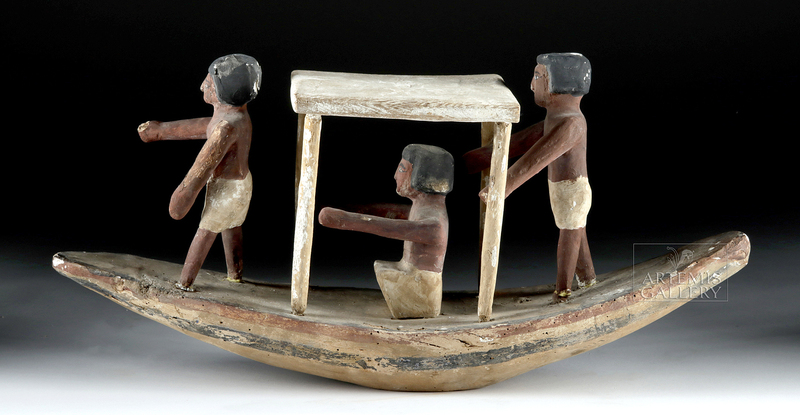 (https://www.mfa.org/collections/object/model-of-a-funerary-boat-143954) As the practice of creating wooden boat models with boatmen continued into the New Kingdom, the numbers continued to increase. In fact, scholars believe that more than 700 figures populated the tomb of Sety I (1294–1279 BCE. Condition: Boatmen have been reattached. Oars are missing as shown. Expected surface wear to boat and boatmen with losses to pigment and gesso, though much remains. Inactive insect holes and nicks/abrasions here and there as shown.